I have heard of this senario many times where you basically pay past registration fees for a car not currently registered all those years. Could not a friend register that car using the ownership in another state first. Then only a transfer back to california might be required? We have some crazy requirements as well but that california one has always stood out. Not even reasonable in my opinion. Ya I think alot of people in california do this, though this would not work in colorado because to register it here the title needs to be a CO title, which requires a vin inspection, which means someone has to see the car. Another reason to dislike CA for auto stuff, they try to gain some revenue by imposing back registration on a vehicle, which only annoys most people, and many others slip around it. Tax them, and they will found a loophole out. Last edited by rcounts; 06-16-2008 at 07:01 PM. PM sent. 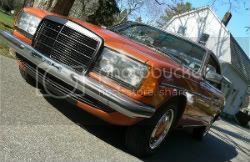 Looking for a W123 passenger side mirror. Good luck with all the cars! in case one of those cars was a typo, im looking for a 123 coupe driver door, without any parts. rule here is two cars untagged/unregistered, not counting any in an enclosed building. If it's been out of reg for 29 yrs, you're good to go, it used to be after 7 yrs it falls out of the system and simply no longer exists, now I believe it is down to 5 yrs. I have no idea what smoke they were blowing at you about pending how it fell out. One thing I learned about CA's DMV's, you go in there being meek and clueless and they smell you coming like a pack of wolves, bend over. Tell them it was stored off the street in a yard, if it was moved and they ask how, always on a flatbed trailer. You just have to say the right words, some people are nice and hint you to what you need to do/say. others say nothing and let you dig a hole. All you need to do is tell them it's been out of the system that long, they will look for an existing record of it on file (which they will not find by now) and then hand you some forms to fill out that give you the right to title it. Then you'll have to take it down to have it inspected to verify it is actually the car (vin/year/model verification to your paperwork) I've been down this road many many times with my antique car habit. No worries. I still need to do that with my 39 Chevy one of these days....it's been long out for over 40 yrs, so no rush. I do demolition derbies and as you can imagine, a lot of people in this "sport" get some pretty pissed off neighbors and have trouble storing their cars. In some places a loophole for this is to store the car on a trailer. Not too sure why but it exempts it from being considered a junk car. Too bad North Carolina only considers a vehicle older than 35 years an antique, otherwise you could cheaply register them that way. I just did so here in Virginia with my 1980 280SL and it is now registered for the life of the car with no more inspections or emissions tests. I don't know about any of your other 31 cars, but if any are over 35 years old you might want to look into it. Anything on the PM I sent about the 126's? Also sent pm need passenger mirrior for my sd. sorry, I am compiling a list, and I will get back to everybody. I responded to some of the email questions. I have been clearing out the non MB's and am currently in the process of acquiring additional storage for the vehicles to get around the storage issue! it looks like I will be able to get a 50x50 metal building for free!!! now, if only the tax nazis don't give me too much greif for runoff and building permits etc... I have a business license for operation out of the site my HVAC company, so I SHOULD be able to have it. I have a large garden, and I use my buildings gutters to fill 20,000 gallons for lawn and garden watering... that ought to get me around the runoff issue.